Although Sicily's proximity to Rome has given the island a rich history, it now stands as a true fledgling among the European powers. Six years before the Normans successfully conquered England, their first true island invasion was launched against the Saracens that occupied Sicily... with more than a little encouragement from the Papacy.King Roger I's nation may be a relative infant, but with an island capital, southern Italy under his control and a healthy relationship with the Papal States, it is an infant that looks likely to survive the journey to adulthood. Condoning the invasion of Sicily was only the beginning for the Papacy's support of the Normans. The sheer presence of Rome midway along the Apennine peninsula now serves as a sturdy political shield from the continental powers to the north. It's a barrier that looks likely to hold so long as the Catholic lords all remain faithful to the Papacy.Hiding behind a shield is however, not the way to establish an empire - nor is any defence without its weakness. The Holy Roman Empire shares borders with the Sicilians, and the armies of the Reich answer to the Kaiser - not the Pope. Even if the Sicilians successfully start to expand up the peninsula, they will soon have to deal with the Milanese and the Venetians. It would seem that the Normans will once again have to take to the waters to expand their latest kingdom. Close to home, other islands like Sardinia and Corsica make tempting targets for invasion. 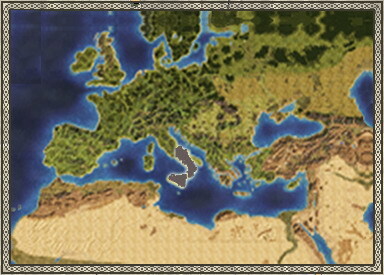 However, the Sicilians will need to look over the horizon to have a hope of long term survival. To the east, the Byzantine Empire is fractured and relatively vulnerable, and there's ample opportunity to take advantage of the chaos on the Iberian peninsula to the west. Can field strong militia, Norman knights and Muslim archers. Lacks good late period cavalry.